Citizen Watch Co., Ltd. (シチズン時計株式会社, Shichizun tokei Kabushiki-gaisha) is an electronics company primarily known for its watches, and is the core company of a Japanese global corporate group based in Tokyo. In addition to Citizen brand watches, it is the parent of American watch company Bulova, and is also known for manufacturing small electronics such as calculators. The company was founded in 1930 by Japanese and Swiss investors. It took over Shokosha Watch Research Institute (founded in 1918) and some facilities of the assembly plant opened in Yokohama in 1912 by the Swiss watchmaker Rodolphe Schmid. The brand Citizen was first registered in Switzerland by Schmid in 1918.. The development of Citizen until World War II relied on technology transfer from Switzerland. Citizen launched the world's first multi-band atomic timekeeping watch in 1993 and has remained a pioneer of this field. Synchronized to atomic clocks, these watches are accurate to within one second in one hundred thousand years. The Skyhawk A-T line features radio-controlled timekeeping. The watches can synchronize with radio clocks in Japan, North America, and Europe, automatically selecting the correct frequency by location. The watch actually tracks two time zones—home and world—but synchronizes to the 'home' zone. When traveling, the user may swap the 'home' and 'world' zones, thereby enabling proper time signal reception on a different continent while retaining the other time. The day, date, and daylight saving time settings are set automatically when the watch is synchronized. These features are comparable to the synchronization with atomic clocks found in Casio Wave Ceptor watches. The Perpetual Chrono A-T synchronizes with the atomic clocks in Colorado or Germany, depending on signal strength and location, and incorporates Eco-Drive technology, so it does not require a battery. In 2010, Miyota (Citizen Watch) of Japan introduced a newly developed movement (UHF 262 kHz) that uses a three-prong quartz crystal for the Precisionist or Accutron II line, a new type of quartz watch with ultra-high frequency (262.144 kHz) which is claimed to be accurate to +/- 10 seconds a year and has a smooth sweeping second hand rather than one that jumps each second. Accurate to within five seconds per year, the Chronomaster line is unofficially the most accurate quartz-crystal watch ever made. They are currently sold only in the Japanese domestic market but can be obtained internationally if ordered online. Citizen also produces the Independent Watches line, featuring a more modern, contemporary design than the traditional Citizen label. Depending on the market, these watches may be labelled "Secret", "Lighthouse" brands among others. The Deployant Clasp with a Push Button (DCP) is a clasp available for many Citizen watch bracelet bands. The clasp, as with the Calibre 8700, is also used with leather bands as if they were metal bracelet-style watchbands; however, when the clasp is fastened, the band appears to be a normal eye-hole and link pin leather watchband. Eco-Drive watches use a battery recharged by a solar panel hidden under the watch face. In the rare and discontinued Eco-Drive Duo series, the solar power was supplemented by an automatic quartz power source. One early model, called the Citizen Vitality, used the watch hands to drive a small electric generator, but was discontinued following complaints that the device could explode and cause wrist injuries. There was also an Eco-Drive Thermo model that exploited temperature differentials between the wearer's skin temperature and ambient temperature to recharge the battery. However, the only Eco-Drive system described on the Citizen Watch official website is the one depending solely on light to recharge. Features similar to the Eco-Drive have been developed by other manufacturers like Casio and Junghans. All Citizen Eco-Drive movements are made in Japan but the case or the bracelet may also be made in China. Q&Q SmileSolar are a line of solar powered watches, which do not require a battery change. They are made of recycled materials and have a water resistant rating of 10 Bar. The line of watches also supports people by making a donation for each watch purchased. Citizen also manufactures calculators and small electronic organizers. Some non-watch devices such as handheld televisions and computer printers, have been marketed under the Citizen brand name. In the 1980s, a number of handheld electronic games were sold under the Q&Q brand. In the early-mid 1990s, Citizen partnered with Compaq Computer Corporation to build notebook computers in Japan for the Japan and Far Eastern market to be sold under the Compaq name. On January 10, 2008, Citizen bought the Bulova Watch Company for $250 million, making The Citizen Group the world's largest watchmaker. In 2016, Citizen acquired the Swiss Frédérique Constant Group. Japan CBM Corporation – Sales of timepieces, including the Q&Q brand. 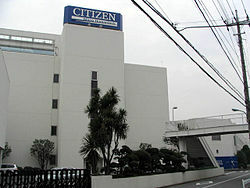 Citizen Systems Japan Co., Ltd. – Sales of business and consumer electronic devices including calculators. Citizen Miyota Co., Ltd. – Production of wristwatches, quartz crystal oscillators, electronic viewfinders, LCD back-light units, CCD/CMOS image sensors, ferroelectric micro LCDs, LCoS, high-density mounting equipment. Citizen Fine Tech Co., Ltd. – Manufacturing and sales of electronic components (ceramic parts, quartz crystal oscillator chips, etc.). Citizen Seimitsu Co., Ltd. – Manufacturing of watch movements, watch face components, automotive components, LCD cells, mini printers, measuring instruments, lubrication units, secondary machining LC lathes and glass scribers. Official timekeeper and official watch of the US Open tennis championships, from 1993 until 2017. Official timekeeping partner of Manchester United F.C. Official partner of the Toronto Maple Leafs: during Leafs games at Air Canada Centre, the scoreboard clock features Citizen branding. ^ a b c "Annual Report FY2010" (PDF). Citizen Holdings. Archived from the original (PDF) on 2011-07-16. Retrieved 2010-10-26. ^ "Bulova introduces the most accurate watch in the world, the Precisionist". Crunch gear. 2010-03-23. Retrieved 2012-07-08. ^ "Q&Q -TIME FOR EVERYONE-". www.smile-qq.com (in Japanese). Retrieved 2017-12-26. ^ "Bulova Watches: A Style Icon Steeped In Tradition". Gems And Jewelry. Retrieved 2017-12-05. ^ a b c d Doerr, Elizabeth. "Citizen Acquires Swiss Frédérique Constant Group As Part Of 'Citizen Global Plan 2018'". Forbes. Retrieved 2017-12-26. ^ "Watches", JP: JCBM https://web.archive.org/web/20081218005951/http://www.jcbm.co.jp/eng/watches/watches.html, archived from the original on 2008-12-18 Missing or empty |title= (help). ^ "Citizen Watch looks to celebrate its 24th year as a sponsor of the US Open Tennis Championships". Citizen. 29 August 2016. Retrieved 30 March 2017. ^ Naas, Roberta (23 July 2018). "Rolex Scores: Takes Over As Official Sponsor and Timekeeper Of US Open Tennis Championships And More". Forbes. Retrieved 10 November 2018. Wikimedia Commons has media related to Citizen Holdings.